Selma is a city in Bexar, Comal, and Guadalupe counties in the U.S. state of Texas. It is part of the San Antonio Metropolitan Statistical Area. The population was 5,540 at the 2010 census, up from 788 at the 2000 census. The estimated population in 2015 was 9,108. The Retama Park horse racing track is located in Selma. The town was famous as a speed trap as referenced in the Steve Earle song "Guitar Town". Selma was settled in 1847 by immigrants from various European countries. The name Selma is a traditional German girl name. In 1849, the Harrison and Brown stagecoach stop was built in Selma to handle passengers and freight on the San Antonio to Austin stagecoach line. John Harrison and his wife Martha moved to Selma in 1852, and he became the first postmaster of the town when the post office opened in 1856. Harrison was also co-owner of the Harrison and McCulloch stage line, which ran a postal route through Selma. Harrison's house still stands by Cibolo Creek, where it was built and is listed on the National Register of Historic Places. German and Polish immigrants constituted most of the next wave of immigrants that settled in the area. By 1885, the population was 145, and at the turn of the century, the population peaked at 600. The population began a quick decline, so much that by 1906 the post office was closed. Selma's population dropped to 100 in 1940. The city incorporated in 1964 and has seen tremendous growth along the Interstate 35 corridor since 2000. The Retama Racing Park opened in 1995, and The Forum, a 110-shop outdoor mall, opened in 2000. The old Harrison and Brown Stagecoach Stop was restored and rechristened the Selma Stage Stop, along with a visitor's center and park. Today Selma is a bustling suburb of San Antonio, but it retains its German and European Heritage in its name and in the descendants of Europeans that still call this town home. Selma has territory in Guadalupe, Bexar and Comal counties. The coordinates of the city center, 29°35′4″N 98°18′21″W﻿ / ﻿29.58444°N 98.30583°W﻿ / 29.58444; -98.30583, is located in northern Bexar County. 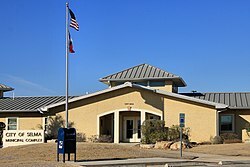 But City Hall, at 9375 Corporate Drive, is located in Guadalupe County, across the border from the city center. The city is bordered by Schertz to the east, Universal City to the south, Live Oak to the southwest, and part of San Antonio to the northwest. The center of Selma is 18 miles (29 km) northeast of downtown San Antonio and 13 miles (21 km) southwest of New Braunfels. Interstate 35 runs through the south-central part of the community, with access from exits 173 and 174. According to the United States Census Bureau, the city has a total area of 5.1 square miles (13.1 km2), of which 0.004 square miles (0.01 km2), or 0.09%, is water. As of the census of 2000, there were 788 people, 286 households, and 217 families residing in the town. The population density was 161.9 people per square mile (62.5/km²). There were 298 housing units at an average density of 61.2/sq mi (23.6/km²). The racial makeup of the city was 86.55% White, 4.57% African American, 1.14% Native American, 1.27% Asian, 0.38% Pacific Islander, 3.93% from other races, and 2.16% from two or more races. Hispanic or Latino people of any race were 30.46% of the population. There were 286 households out of which 33.9% had children under the age of 18 living with them, 67.1% were married couples living together, 5.2% had a female householder with no husband present, and 24.1% were non-families. 17.8% of all households were made up of individuals and 4.9% had someone living alone who was 65 years of age or older. The average household size was 2.73 and the average family size was 3.17. In the town the population was spread out with 25.4% under the age of 18, 8.1% from 18 to 24, 24.9% from 25 to 44, 31.5% from 45 to 64, and 10.2% who were 65 years of age or older. The median age was 40 years. For every 100 females, there were 107.9 males. For every 100 females age 18 and over, there were 104.9 males. The median income for a household in the town was $51,979, and the median income for a family was $62,344. Males had a median income of $39,479 versus $27,222 for females. The per capita income for the city was $22,492. About 5.1% of families and 5.5% of the population were below the poverty line, including 7.8% of those under age 18 and none of those age 65 or over. ^ "Subcounty population estimates: Texas 2000-2006". United States Census Bureau, Population Division. 2007-06-28. Archived from the original (CSV) on 2007-11-26. Retrieved 2008-01-09. ^ a b "Geographic Identifiers: 2010 Demographic Profile Data (G001): Selma city, Texas". U.S. Census Bureau, American Factfinder. Retrieved April 14, 2014. ^ "Annual Estimates of the Resident Population for Incorporated Places: April 1, 2010 to July 1, 2015". Archived from the original on July 14, 2016. Retrieved July 2, 2016. ^ U.S. Geological Survey 7.5-minute topographic map series, Schertz quadrangle, 2013. Acme Mapper. Inventory of the Retama Park records, University of Texas at San Antonio Libraries (UTSA Libraries) Special Collections. This page was last edited on 15 April 2019, at 02:10 (UTC).